The bar inside 45 Jermyn St, with its lovely Martin Brudnizki-designed interior, twinkles. This is even before you’ve downed a couple of their excellent Negronis with enormous gobstopper-sized blocks of ice. It’s where we imagine an old school starlet would go to celebrate landing a lead part. Thankfully, no such lifestyle leap has ever been needed to enjoy their cocktail list. 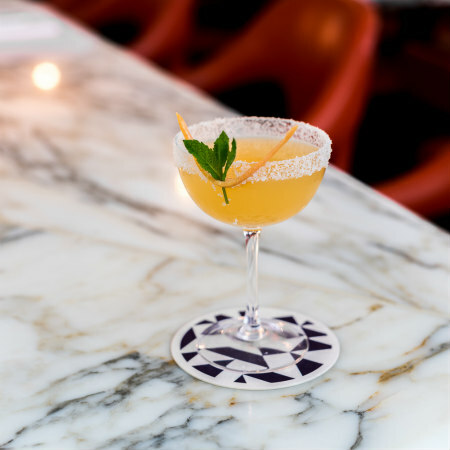 They’ve now mixed things up, however, and we love the deliriously smoky Oaxaca gimlet made with this year’s trendiest liquor – mezcal. It’s true that not everyone wants mezcal in their cocktail, however, in which case you might want to try one of their delicious rickies. These are highball drinks made with spirits, soda water and homemade syrups. You can then play apothecary and add drops of “acid” from a pipette to change the flavour, giving your drink a pleasingly sour note. If you’re worried this all seems a bit louche, the menu of bar snacks is bracingly palate cleansing in the best way, from mackerel tacos to seared tuna. Monday to Saturday 08.00 - 23.30, Sunday 08.00 - 18.00.